Torquato Tasso, born at Sorrento, March 11, 1544, was the son of Bernardo Tasso by Portia de Rossi, a lady of a noble Neapolitan family. His father was a man of some note, both as a political and as a literary character; and his poem "Amadigi," founded on the well-known romance of Amadis de Gaul, has been preferred by one partial critic even to the "Orlando Furioso." Ferrante Sanseverino, Prince of Salerno, chose him for his secretary, and with him and for him Bernardo shared all the vicissitudes of fortune. That prince having been deprived of his estates, and expelled from the kingdom of Naples by the Court of Spain, Bernardo was involved in his proscription, and retired with him to Rome. 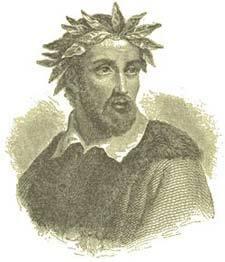 Torquato, then five years old, remained with his mother, who went to reside with her family in Naples. Bernardo Tasso having lost all hopes of ever returning to that capital, advised his wife to retire with his daughter into a nunnery, and to send Torquato to Rome. Our young poet suffered much in parting from his mother and sister; but, fulfilling the command of his parents, he joined his father in October, 1554. On this occasion he composed a canzone, in which he compared himself to Ascanius escaping from Troy with his father AEneas. The fluctuating fortunes of the elder Tasso caused Torquato to visit successively Bergamo, the abode of his paternal relatives, and Pesaro, where his manners and intelligence made so favorable an impression, that the Duke of Pesaro chose him for companion to his son, then studying under the celebrated Corrado, of Mantua. In 1559, he accompanied his father to Venice, and there perused the best Italian authors, especially Dante, Petrarch, and Boccaccio. The next year he went to the University of Padua, where, under Sperone Speroni and Sigonio, he studied Aristotle and the critics; and by Piccolomini and Pandasio he was taught the moral and philosophical doctrines of Socrates and Plato. However, notwithstanding his severer studies, Torquato never lost sight of his favorite art; and at the age of seventeen, in ten months, he composed his "Rinaldo," a poem in twelve cantos, founded on the then popular romances of Charlemagne and his paladins. This work, which was published in 1562, excited great admiration, and gave rise to expectations which were justified by the "Jerusalem Delivered." The plan of that immortal poem was conceived, according to Serassi's conjecture in 1563, at Bologna, where Tasso was then prosecuting his studies. The first sketch of it is still preserved in a manuscript, dated 1563, in the Vatican Library, and printed at Venice in 1722. Unfortunately, while thus engaged, he was brought into collision with the civil authorities, in consequence of some satirical attacks on the University, which were falsely attributed to him. The charge was refuted, but not until his papers had been seized and himself imprisoned. This disgusted him with Bologna, and he returned to Padua in 1564. There he applied all his faculties to the accomplishment of his epic poem; collected immense materials from the chronicles of the Crusades; and wrote, to exercise his critical powers, the "Discorsi" and the "Trattato sulla Poesia." While thus engaged, the Cardinal Luigi d'Este appointed him a gentleman of his court. Speroni endeavored to dissuade the young poet from accepting that office, by relating the many disappointments which he had himself experienced while engaged in a similar career. These remonstrances were vain; Tasso joined the cardinal at Ferrara at the end of October, 1564, and soon attracted the favorable notice of the Duke Alfonso, brother of the cardinal, and of their sisters; one of whom, the celebrated Eleanora, is commonly supposed to have exercised a lasting and unhappy influence over the poet's life. Ferrara continued to be his chief place of abode till 1571, when he was summoned to accompany his patron the cardinal to France. The gayeties of Ferrara, celebrated in that age for its splendor, did not prevent his prosecuting his poetic studies with zeal; for it appears from his will, quoted by Mr. Stebbing, that, at his departure for France he had written a considerable portion of the "Jerusalem," besides a variety of minor pieces. His reputation was already high at the court of France, where he was received by Charles IX. with distinguished attention. But he perceived, or fancied that he saw, a change in the cardinal's demeanor toward him, and, impatient of neglect, begged leave to return to Italy. In 1572 he was at Rome with the Cardinal Ippolito d'Este. In the same year he entered the service of the Duke of Ferrara, and resumed with zeal the completion and correction of the "Jerusalem." In 1573, Tasso wrote his beautiful pastoral drama "Aminta." This new production added greatly to his reputation. He chose simple Nature for his model; and succeeded admirably in the imitation of her. The "Jerusalem Delivered" was completed in 1575. Tasso submitted it to the criticism of the most learned men of that age. The great confusion which prevailed in the remarks of his critics caused him extraordinary uneasiness. To answer their objections, he wrote the "Lettere Poetiche," the best key to the true interpretation of his poem. Tasso and the Two Eleanors. During 1575, Tasso visited Pavia, Padua, Bologna, and Rome, and in 1576 returned to Ferrara. His abode there never was a happy one; for his talents, celebrity, and the favor in which he was held, raised up enemies, who showed their spleen in petty underminings and annoyances, to which the poet's susceptible temper lent a sting. He was attracted, however, by the kindness of the duke and the society of the beautiful and accomplished Eleanora, the duke's sister, for whom the poet ventured, it is said, to declare an affection which, according to some historians, did not remain unrequited. The portrait of Olinda, in the beautiful episode which relates her history, is generally understood to have been designed after this living model; while some have imagined that Tasso himself is not less clearly pictured in the description of her lover, Sofronio. There was also another Eleanor, a lady of the court with whom the poet for a while imagined himself in love. But about this time, whether from mental uneasiness, or from constitutional causes, his conduct began to be marked by a morbid irritability allied to madness. The "Jerusalem" was surreptitiously printed without having received the author's last corrections; and he entreated the duke, and all his powerful friends, to prevent such an abuse. Alfonso and the pope himself endeavored to satisfy Tasso's demands, but with little success. This circumstance, and other partly real, partly imaginary troubles, augmented so much his natural melancholy and apprehension, that he began to think that his enemies not only persecuted and calumniated him, but accused him of great crimes; he even imagined that they had the intention of denouncing his works to the Holy Inquisition. Under this impression he presented himself to the inquisitor of Bologna; and having made a general confession, submitted his works to the examination of that holy father, and begged and obtained his absolution. His malady, for such we may surely call it, was continually exasperated by the arts of his rivals; and on one occasion, in the apartments of the Duchess of Urbino, he drew his sword on one of her attendants. He was immediately arrested, and subsequently sent to one of the Duke's villas, where he was kindly treated and supplied with medical advice. But his fancied injuries (for in this case they do not seem to have been real) still pursued him; and he fled, destitute of everything, from Ferrara, and hastened to his sister Cornelia, then living at Sorrento. Her care and tenderness very much soothed his mind and improved his health; but, unfortunately, he soon repented of his hasty flight, and returned to Ferrara, where his former malady soon regained its power. Dissatisfied with all about him, he again left that town; but, after having wandered for more than a year, he returned to Alfonso, by whom he was received with indifference and contempt. By nature sensitive, and much excited by his misfortunes, Tasso began to pour forth bitter invectives against the duke and his court. Alfonso exercised a cruel revenge; for, instead of soothing the unhappy poet, he shut him up as a lunatic in the hospital of St. Anne. Yet, strange to say, notwithstanding his sufferings, mental and bodily, for more than seven years in that abode of misery and despair, his powers remained unbroken, his genius unimpaired; and even there he composed some pieces, both in prose and verse, which were triumphantly appealed to by his friends in proof of his sanity. To this period we may probably refer the "Veglie," or "Watches" of Tasso, the manuscript of which was discovered in the Ambrosian Library, at Milan, toward the end of the last century. They are written in prose, and express the author's melancholy thoughts in elegant and poetic language. The "Jerusalem" had now been published and republished both in Italy and France, and Europe rang with its praises; yet the author lay almost perishing in close confinement, sick, forlorn, and destitute of every comfort. In 1548, Camillo Pellegrini, a Capuan nobleman, and a great admirer of Tasso's genius, published a "Dialogue on Epic Poetry," in which he placed the "Jerusalem" far above the "Orlando Furioso." 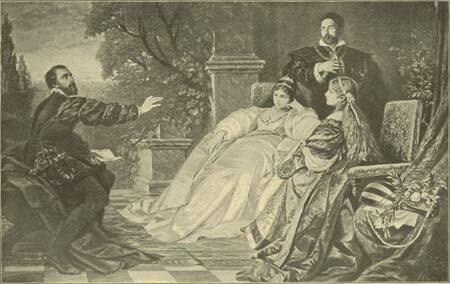 This testimony from a man of literary distinction caused a great sensation among the friends and admirers of Ariosto. Two academicians of the Crusca, Salviati and De Rossi, attacked the "Jerusalem" in the name of the academy, and assailed Tasso and his father in a gross strain of abuse. From the mad-house Tasso answered with great moderation; defended his father, his poem, and himself from these groundless invectives; and thus gave to the world the best proof of his soundness of mind, and of his manly, philosophical spirit. At length, after being long importuned by the noblest minds of Italy, Alfonso released him in 1586, at the earnest entreaty of Don Vincenzo Gonzaga, son of the Duke of Mantua, at whose court the poet for a time took up his abode. There, through the kindness and attentions of his patron and friends, he improved so much in health and spirits that he resumed his literary labors, and completed his father's poem, "Floridante," and his own tragedy, "Torrismondo." But, with advancing age, Tasso became still more restless and impatient of dependence, and he conceived a desire to visit Naples, in the hope of obtaining some part of the confiscated property of his parents. Accordingly, having received permission from the duke, he left Mantua, and arrived in Naples at the end of March, 1588. About this time he made several alterations in his "Jerusalem," corrected numerous faults, and took away all the praises he had bestowed on the House of Este. Alfieri used to say that this amended "Jerusalem" was the only one which he could read with pleasure to himself or with admiration for the author. But as there appeared no hope that his claims would be soon adjusted, he returned to Rome in November, 1588. Ever harassed by a restless mind, he quitted, one after another, the hospitable roofs which gave him shelter; and at last, destitute of all resources and afflicted with illness, took refuge in the hospital of the Bergamaschi, with whose founder he claimed relation by the father's side; a singular fate for one with whose praises Italy even then was ringing. But it should be remembered, ere we break into invectives against the sordidness of the age which suffered this degradation, that the waywardness of Tasso's temper rendered it hard to satisfy him as an inmate, or to befriend him as a patron. Restored to health, at the grand duke's invitation he went to Florence, where both prince and people received him with every mark of admiration. Those who saw him as he passed along the streets, would exclaim, "See! there is Tasso! That is the wonderful and unfortunate poet!" It is useless minutely to trace his wanderings from Florence to Rome, from Rome to Mantua, and back again to Rome and Naples. At the latter place he dwelt in the palace of the Prince of Conca, where he composed a great part of the "Jerusalem Conquered." But having apprehended, not without reason, that the prince wished to possess himself of his manuscripts, Torquato left the palace to reside with his friend Manso. His health and spirits improved in his new abode; and besides proceeding with the "Jerusalem Conquered," he commenced, at the request of Manso's mother, "Le Sette Giornate del Mondo Creato," a sacred poem in blank verse, founded on the Book of Genesis, which he completed in Rome a few days before his death. He visited Rome in 1593. A report that Marco di Sciarra, a notorious bandit, infested the road, induced him to halt at Gaeta, where his presence was celebrated by the citizens with great rejoicing. Sciarra having heard that the great poet was detained by fear of him, sent a message purporting that, instead of injury, Tasso should receive every protection at his hands. This offer was declined; yet Sciarra, in testimony of respect, sent word that for the poet's sake he would withdraw all his band from that neighborhood; and he did so. This time, on his arrival at Rome, Tasso was received by the Cardinals Cinzio and Pietro Aldobrandini, nephews of the pope, not as a courtier, but as a friend. At their palace he completed the "Jerusalem Conquered," and published it with a dedication to Cardinal Cinzio. This work was preferred by its author to the "Jerusalem Delivered." It is remarkable that Milton made a similar error in estimating his "Paradise Regained." In March, 1594, Tasso returned to Naples in hope of benefiting his rapidly declining health. The experiment appeared to answer; but scarcely had he passed four months in his native country, when Cardinal Cinzio requested him to hasten to Rome, having obtained for him from the pope the honor of a solemn coronation in the Capitol. In the following November the poet arrived at Rome, and was received with general applause. The pope himself overwhelmed him with praises, and one day said, "Torquato, I give you the laurel, that it may receive as much honor from you as it has conferred upon them who have worn it before you." To give to this solemnity greater splendor, it was delayed till April 25, 1595; but during the winter Tasso's health became worse. Feeling that his end was nigh, he begged to be removed to the convent of St. Onofrio, where he was carried off by fever on the very day appointed for his coronation. His corpse was interred the same evening in the church of the monastery, according to his will; and his tomb was covered with a plain stone, on which, ten years after, Manso, his friend and admirer, caused this simple epitaph to be engraved--Hic Jacet Torquatus Tasso.